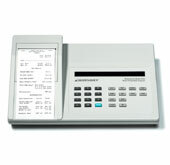 Results are printed using the analyzer's built-in thermal printer. The analyzer is powered by a built-in battery pack. Carrying case, battery charger, patient cable, sensor pad electrodes, print rolls, and user's guide are included. The BIA 310 Bioimpedance Analyzer does not diagnose disease or recommend treatment regimens, or quantify treatment effectiveness. Only a qualified health care professional can make these judgments.